Coincidentally Wendy’s approach is business model that I have been exploring myself. There are quite a few people in the area that offer quilting services but I have always liked the idea of completing all the phases of a project myself. Also, I love the quilting part except for fighting with a large project on a domestic machine. I know I am not alone in those sentiments. In my research, I came across many stores offering rental services and thought it would be a wonderful idea to have that locally. And another instructional option really appeals to the teacher in me. Unfortunately, we do not have a suitable space in our home. 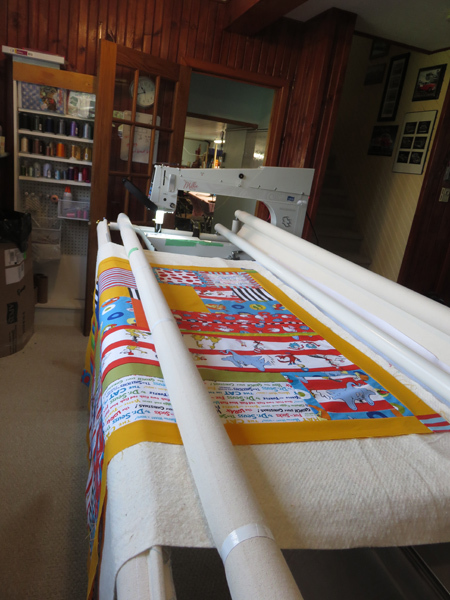 A longarm quilt machine is a large piece of equipment. Table lengths vary but typically start at 10’. Factoring in room to work around it easily, it requires a minimum of space of about 13’ x 8’ and for a rental business, a longer working surface would be recommended. Good natural lighting is a definite advantage. A longarm is used to stitch together the quilt top, batting and backing. It differs from a domestic home machine in that you move the sewing head along rollers on a table to do the stitching. The quilt remains stationary. Since I first saw someone using one, it has seemed a more pleasant way to work than fighting with a quilt on my home machine. From the first time I tried it, I was hooked. It struck me like the difference between moving a pencil and moving the paper. Don’t get me wrong – I enjoy walking foot quilting or Free Motion Quilting (FMQ) on my home machine but for large projects, it can be a daunting task and, therefore, a contributing factor to the collection of Unfinished Objects (UFOs). 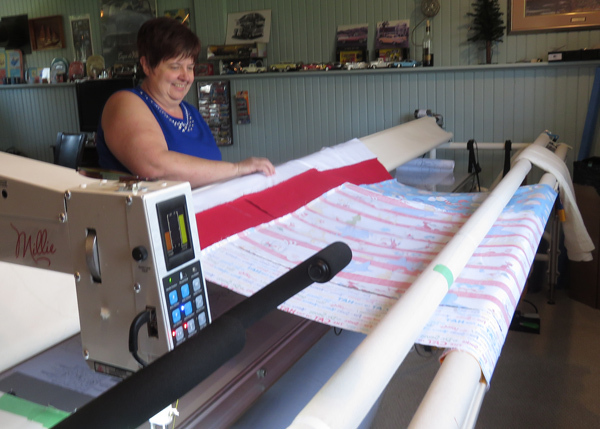 Even given the lack of space in our current home, I have been dreaming about a longarm. So I ran into a quilting friend who told me about Songbird, I didn`t waste any time getting in touch with Wendy by email. We arranged a time to meet a few days later and I headed to Lawrencetown. Wendy has her APQS Millie in a beautiful bright room with a view of the many birds in her yard. Wendy loading my quilt on the machine. 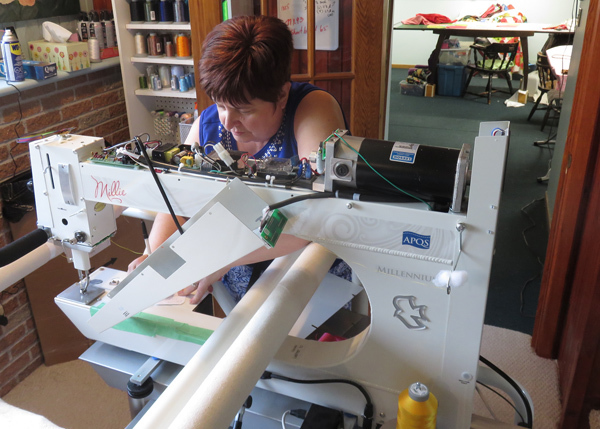 Wendy set me up to try a couple of pantographs (patterns) to follow, which helped get a feel for the machine then I was able to move directly to quilting a baby quilt that I brought for practice – all in under two hours. I even had a chance to play with free motion. With long arms, there are different options for creating patterns. Most can use computerized designs that go edge to edge with a pattern. You can also use free hand designs or Pantographs, continuous line drawings that provide a pattern. I don’t think that I would like computerized designs. I like the idea of free hand but pantographs are a great option when you are getting started or trying new complex patterns. Also, it seems that getting comfortable with those would be a way to ease into using longarm. After I finished my quilt with pantograph pattern (a sort of wonky spiral that fit well with my Seuss pattern, I felt more confident to try freehand. Here is a short video from Sparrow Quilt Co. that demonstrates how to stitch with a pantographs using an APQS Millie longarm. One of the best parts of finishing with a longarm was not having to baste the quilt. This might seem like a small thing, but anyone who has ever done it knows what a tedious and time-consuming task that can be. The time flew by and I had a blast! I am definitely going to take out some of the other projects in my stash and get them quilted. It is so much faster than doing them on my machine. And much more relaxing since I don’t have to fight all the fabric. Plus, I have some designs that I have been wanting to try that would work much more easily with the open space and control of the longarm machine. While Wendy was getting things set up, we were chatting about her new venture and my interests. I asked her if she would mind me taking a few pictures for a Tech Tuesday blog post and she said she didn’t mind at all. As a bonus (for me, probably not for Wendy), the machine decided it felt the need for a new fuse. Wendy had to open up the back of the machine and contact customer support for this new issue. Millie’s inner workings up close. That gave me the unusual opportunity to have a look at the workings – including the fuse that had to be replaced. I always like seeing the inner operation so the delay turned out to have a silver lining. Wendy told me that she does do quilting for others but is most passionate about helping quilters learn to do it themselves, and providing them the place to do it. If you want to do your own quilting with out the expense or space requirement of buying a longarm – or if you are thinking of buying one and want to try it out – email Wendy and book a time to visit Songbird Quilter. She takes care of all the maintenance and provides new needles and thread for every project. ‘Millie’ has a stitch regulator that ensures even stitches at any speed, making it easier to control for new users. 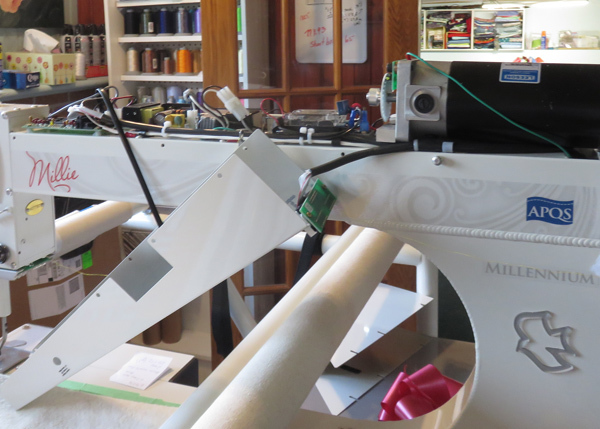 Millie is surprising light and easy to maneuver – and much quieter than some other longarm machines I have seen. Check it out. You might be amazed at how fun and easy it is. Big thanks to Wendy. I had a great time and will be going back to play again soon. Of course, I am still holding out hope that I will win the lottery and be able to buy my own Millie. In the meantime, I am really glad to see this service on the Eastern Shore. 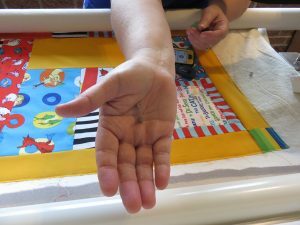 Do you have experience with longarm quilting? Do you own or rent? Do you have any advice for beginners? Share your thoughts in the comments. What a super idea. 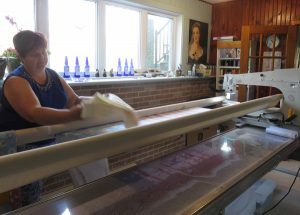 Have been to Sparrw for a demo and can’t wait to come to N.S.and do some of my own at Wendy’s.she is a great teacher and friend. Very interesting idea. I think this is a wonderful opportunity to get some UFO’s completed. Looking forward to investigating this new opportunity and perhaps trying something new.